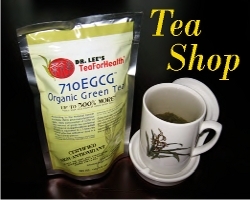 Dr. Lee's high antioxidant green teas are grown and tested to strict standards. Every batch of TeaForHealth green tea is tested for total amount of green tea catechins and EGCG content prior to packaging to ensure that they meet our high specifications. Brew beverages in an OX oxygen exclusion tea steeper for maximum retention of catechin antioxidants. TeaForHealth's natural green tea is harvested from the first crop of the spring and the last crop of the fall season. These select tender tea leaves have a smooth, mellow flavor with a full, fresh taste. Brewing tea in our patented OX™ tea steeper preserves 15-20% more antioxidants. Keep one at home and one at the office. Select a different design for each member of the family! No atmospheric oxygen between the lid and the hot tea. A reservoir in the base to contain the overflowing hot water. A stand in the base for the lid to rest securely.